It feels like a long time since the last release from Ensemble Clément Janequin. They’ve been going for about 35 years, and new recordings have been rarer in recent years, but this one – issued just in time to brighten my Christmas – is as impressive in its way as anything I’ve heard from them, and that’s saying something. This musical tableau dramatises the different attitudes to Christmas at the mid-point of the 16th century. It opens with a seasonal plainsong hymn, solemnly intoned, albeit to a ternary lilt. Immediately there follows a parody set to the same tune, and initially sung in the same way, but before the verse is out the tone has begun to change as the text enumerates the victuals gathered at the festive table and describes their increasingly marked effects on the assembled company, the words slurred, the pitching and rhythm listing more and more. It’s classic Dominique Visse, and it had me laughing aloud. Thereafter, the disc alternates sacred and secular with immaculate poise. The former is beautifully done – the accompaniment on chamber organ is reminiscent of their past work in this register – and the latter delivered as lustily as ever. 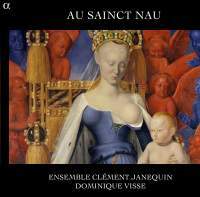 Harking back to the ensemble’s Protestant psalm project, French chansons have their frankly smutty texts replaced by touching depictions of the Nativity. Towards the conclusion, the tension between Protestants and Catholics bursts out into open hostility in a series of musical pamphlets, in which the two faiths consign each other to the devil with equal venom (and, it must be said, relish). The ensemble continues to do what it does best but retains a freshness and questing spirit that sometimes eludes groups of comparable vintage, a sense of joyous music-making that marked them out from the start and which they’ve never lost. It was utterly infectious then, and it still is.